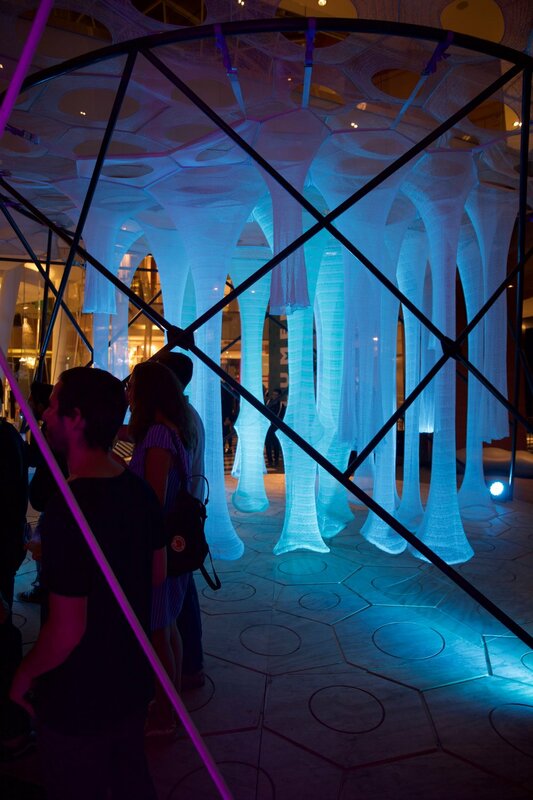 Lumen @Constructo is knitted light, an adaptive architecture that immerses visitors in a responsive glow of photo-luminescence. Inhabiting the multi-story atrium of Mall Plaza, the project features a large canopy originally on view as part of Jenny Sabin Studio’s winning entry, Lumen, for MoMA and MoMA PS1 YAP 2017. Two new nested canopies generate interactive spaces within the 10.5-meter-tall steel and rope towers. 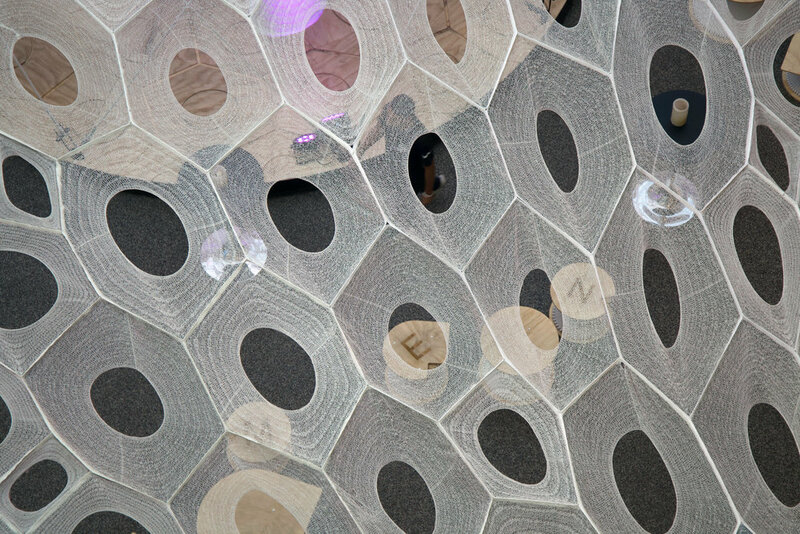 This matrix of lightweight knitted canopy structures composed of responsive tubular and cellular components employs textiles, photo-luminescent, and solar active fibers that absorb, collect, and deliver light within the Mall Plaza atrium in Santiago, Chile. It is a socially and environmentally responsive structure that is interactive and transformative. This environment offers spaces of respite, exchange, and engagement as the canopy filters light, casts dynamic shadows on the ground floor, and changes throughout the day. It is an open responsive system featuring digitally knitted lightweight, high-performing, formfitting, and adaptive materials. Lumen @Constructo is an experiment, taking risks through collaboration across disciplines to innovate architecture that is transformative, interactive, inclusive, and socially engaging in multiple contexts and publics. It is a new nature.